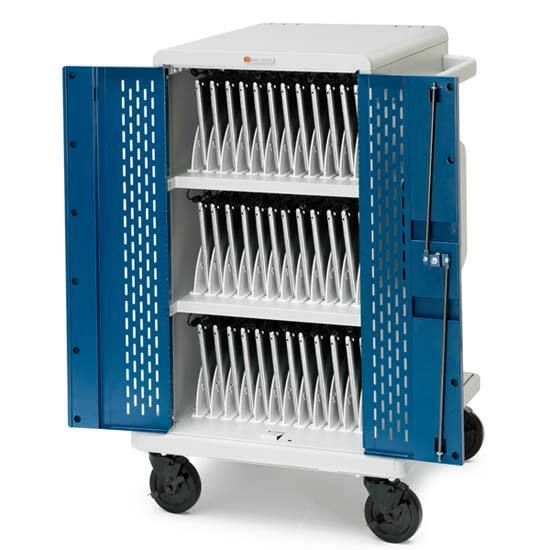 Laptop carts are increasingly becoming an important part of a school’s technology stock. Laptops are more mobile than traditional desktops can be stored in smaller areas and probably most importantly; don’t require a dedicated computer lab – a laptop storage cart can be wheeled into the classroom and network setup in a short amount of time. Choosing the right laptop cart can be tricky; there are many models to choose from, each with their own unique features. Crucial to all laptop carts is the ability to charge them when not in use. An housed in a sturdy metal case, an automatic laptop charging timer allows you to charge all of your laptops off one outlet, without fear of overloading your room’s power outlet. After the set amount of time has passed, the timer switches the power from the first bank of laptops to the second, providing you with easy, seamless charging with minimal maintenance. Perhaps the gold standard in school laptop carts is the fully assembled laptop storage cart by Bretford. 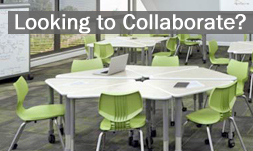 It features storage for up to 30 laptops – a full classroom’s worth – and rides on convenient 8″ casters, designed to traverse even the most cumbersome doorjambs – perfect for the teacher moving from building to building. Rubber mats protect laptops from static shock and prevent items from sliding around during transit. An additional rubber mat sits atop the unit itself, protecting the surface and keeps bulky items like overhead projectors, LCD projectors and printers from sliding while in transit. The case is made from sturdy steel with ample ventilation – perfect for dissipating heat build up during battery recharges. Sandusky Lee has announced a new model based on Bretford’s now classic design, the Mobile Laptop Security Cabinet. It also features a high capacity volume, along with two unique features: a locking, rear opening access portal which makes accessing your charging hardware, surge protectors, and cable management easier. A lip around three sides provides additional peace of mind for equipment riding on top of the cart like laser printers, LCD or DLP projectors, Ventilated sides prevents inevitable heat buildup, and the front features an innovative locking clasp. Balt continues to provide great value, with a flat packed locking laptop cart that holds either 10 or 20 laptops, and includes two racks for power strips and their cords. Wire management inside with a black steel frame. Shelves are designed to vent heat to the top and out through the rear. Doors open a full 270 degrees and attack to the side of the laptop cart for maximum space saving. As laptop carts have become more popular, more models become available to fill specific niches. There is now a wood model with black top to match your science classroom’s furniture and tables, as well as a model specifically designed for use as a Macbooks and Chromebooks. hey… that's nice blog… it remembers me of my school days.. thanks…. hope u'll keep doin it…!!! High quality power strips are required if you want to ensure the safety of your personal computer. I always buy branded power strips at home.